Two initiatives of the Third World Centre for Water Management. Project Report. For most of the 1990s, in spite of the rhetoric to the contrary, water basically disappeared from the international political agenda. For example, during the UN Conference on Environment and Development, held in Rio de Janeiro in 1992, not even a single head of state referred to the problem of looming water crisis that the world was facing. Suddenly, at the beginning of the twenty-first century, water became a popular subject. The United Nations Committee on Sustainable Development decided water was a priority issue. The U.N. General Assembly declared 2003 the International Year of Freshwater and the period 2005-15 the International Decade for Action: Water for Life. 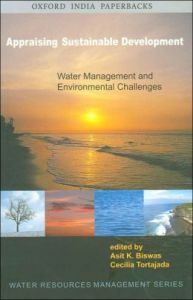 Appraising Sustainable Development: Water Management and Environmental Challenges has been published by Oxford University Press. It is based on the results of the Global Water Resources in the 21st Century and Sustainable Development project. SPF supported projects on water during the 1990s, with the focus on water as a catalytic force to reduce regional tensions and to promote peace. Among these initiatives was the establishment of the Middle East Water Commission, chaired by Professor Asit K Biswas, over the period 1993-96. The report of this commission (Core and Periphery: A Comprehensive Approach to Middle Eastern Water, by Asit K. Biswas et al., Oxford University Press, 1997) played an important role in facilitating the eventual peace treaties between Israel and Jordan and between Israel and the Palestine Liberation Organization. At the beginning of the new millennium, SPF sponsored two major pro­ jects of the Third World Centre for Water Management, an independent think tank based in Atizapan, Mexico, that specializes in the generation, synthesis, application, and dissemination of knowledge. The first project was an objective and comprehensive reassessment of the applicability of the sustainable development paradigm to the water sector. Leading international experts were invited to a workshop at the Bibliotheca Alexandria, Egypt, in 2002. The workshop attempted to answer two challenging issues: the implementation potential of the concept of sustainable development in the real world, and its possible application to make water management more efficient and equitable than at present. It analyzed complex questions such as what exactly is meant by sustainable development, and whether a single paradigm of sustainable water resources management can encompass all countries of a very heterogeneous world, with very different cultures, social norms, physical attributes, climatic conditions, institutional and legal framework and systems of governance. A definitive book based on the results of this project has just been published: Appraising Sustainable Development: Water Management and Environmental Challenges, edited by Asit K Biswas and Cecilia Tortajada (Oxford University Press, 2005). A summary of the Alexandria workshop was published in SPF Voices No. 35, in January 2003. The second Centre project that SPF supported was an assessment of the impacts of megaconferences (defined as conferences attended by more than 2,000 people) on the water sector. These megaconferences are now being organized more and more frequently, and their cost is increasing significantly. In spite of the increasing frequency and the rapid acceleration in their organizational costs, the actual impacts of even one of these events had never been objectively assessed. In order to obtain a clearer picture of their impacts and cost effectiveness, the Centre carried out a global study with SPF-USA support. The impacts evaluated were for the Mar del Plata, Dublin, Rio de Janeiro, and Johannesburg conferences (all organized by the U.N.), the Freshwater Consultation in Bonn, and the three World Water Forums organized by the World Water Council, held in Marrakech, The Hague, and Japan. A questionnaire was sent to 2,698 people from 121 countries, among whom were the members of the World Water Council and the Inter­ national Water Resources Association, as well as the participants in recent major water conferences. Nearly 28% of the people who received the questionnaire responded. Considering the global, multi-institutional, and multi-sectoral nature of the survey, the response rate can be considered quite good. Specific countries or regions were also selected for in-depth studies. These were for Australia, Bangladesh, Brazil, India, Japan, Scandinavia, and Southern Africa. In addition, think pieces were commissioned from distinguished water experts from different parts of the world, including a deputy secretary­ general of a major U.N. megaconference. All these papers and the main findings of the global survey were discussed at a workshop in Bangkok, January 29-30, 2005, where leading water experts from different countries were invited to review the findings and the commissioned papers. Overall, the survey respondents were very positive about the cost effectiveness of the U.N. Water Conference in Mar del Plata. The consensus was that no other megaconference equaled, let alone exceeded, the impacts of Mar del Plata. In contrast, the respondents felt that the World Water Forums, specifically the Japan forum, were not cost effective. They were badly organized, with the strategic error of having been organized in three cities, which made it impossible for the participants to attend the sessions in which they were interested. The criterion for success appeared to be the number of people pre­ sent and number of countries rep­ resented, not the quality of presentations, discussions, or outputs and impacts; the organizational costs were very high because of numerous nonessential activities and the absence of a clear focus on the objectives of the event. The cost effectiveness was poor for a variety of reasons, including inadequate emphasis on information dissemination. Nearly 90% of the respondents felt that in the light of the experience of the Japan forum, an attempt should be made to redesign/restructure/rethink the way megaconferences are organized in order to increase their impacts and cost effectiveness substantially. Nearly 44% of the respondents felt that megaconferences had no perceptible impacts, or at best marginal impacts, on the individuals concerned and on their institutions. Another 11.5% were even more negative in their assessments. In contrast, 7% felt that the events were “excellent,” and 26% felt that the conferences had perceptible impacts on their institutions. Another 11.5% of the respondents did not express any view. Respondents from the United States, Canada, and Western Europe were notably more skeptical of the benefits and impacts of these events than participants from developing countries. The overall views on the megaconferences are summed up in the table above. Significantly reduce the frequency and expense of megaconferences. If a conference is considered necessary, analyze its purpose rigorously with a view to achieving it through a smaller regional and/or sectoral meeting, not necessarily through a global megaconference. Improve the planning, clarity of purpose, structure, attendance, and follow-up of each megaconference and of each smaller meeting. Link each megaconference firmly into the regular ongoing processes of water development and management. Evaluate each megaconference using independent evaluators. Asit K. Biswas is president of the Third World Centre for Water Management. One of the world’s best-known water experts, he has been an advisor to six heads of U.N. agencies and 17 governments at the ministerial/secretarial level. He is one of the two original founders of the World Water Council, which organizes the World Water Forums. Cecilia Tortajada is vice-president of the Third World Centre for Water Management and is also vice-president of the International Water Resources Association. A biologist by training, she is considered one of Latin America’s leading water authorities.